November is Thanksgiving, Veterans’ Day, voting, and Christmas/Holiday Prep. We’re all thankful for 4-H and we remember with honor the veterans who helped guarantee our many freedoms, including the freedom to vote (did you?). Christmas/Holiday Prep, well, let’s push that into next month! Each year, this month, Veteran’s Day has special meaning. We feature individuals and groups with a 4-H identity. Of course, many more 4-H alumni deserve to be honored and remembered for their service to the US; these are but a few. A school superintendent from Ohio instilled scientific curiosity in his students and formed “experiment clubs” to keep them involved. 4-H Clubs evolved, using educational materials this pioneer encouraged from his USDA colleagues. One of our continuing series featuring people who helped make 4-H great. By all accounts and on all levels, 2015 NAE4-HA in Portland was a great success. 4-H History Preservation team encouraged nominations to the National 4-H History Map, and collected countless sites which will be vetted for inclusion. There’s a lively controversy about when “urban 4-H” actually started. But what year did the National 4-H Foundation announce a study, funded by the Ford Foundation, to document that expansion of 4-H? Take a break in your Thanksgiving preparations, give fleeting thought to your Christmas or Holiday preparations, and enjoy this issue. 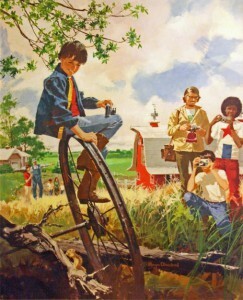 Novemver 2, 1936 one calendar company was issued permission by USDA to produce 4-H Calendars. The first and the latest calendar art that National 4-H Council owns for which we have found documentation are pictured here. 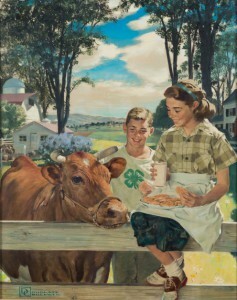 One appeared on a 1951 National 4-H calendar and the other appeared on a 1975 National 4-H calendar. This entry was posted in 4-H History Preservation Newsletter, History and tagged 4-H History Preservation Newsletter by NewsAdmin. Bookmark the permalink.